Christmas is quickly approaching, which means it’s the season of lists. Lists of gifts we still need to buy, lists of upcoming holiday festivities and a list of chores to get done before family comes over. Oh, and we can’t forget Santa’s naughty and nice list! Much like good old Saint Nick, brides in full on wedding-planning mode are making lists and checking them twice all year round. 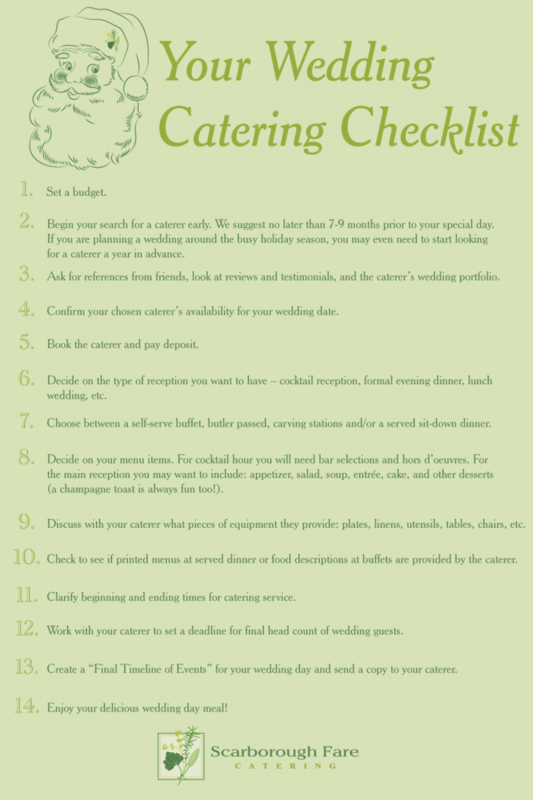 To make it a little easier, Scarborough Fare Catering has put together a step-by-step to-do checklist to help you cover all the details of catering your big day! Begin your search for a caterer early. We suggest no later than 7-9 months prior to your special day. If you are planning a wedding around the busy holiday season, you may even need to start looking for a caterer a year in advance. Ask for references from friends, look at reviews and testimonials, and the caterer’s wedding portfolio. Confirm your chosen caterer’s availability for your wedding date. Book the caterer and pay deposit. Decide on the type of reception you want to have – cocktail reception, formal evening dinner, lunch wedding, etc. Choose between a self-serve buffet, butler passed, carving stations and/or a served sit-down dinner. Decide on your menu items. For cocktail hour you will need bar selections and hors d’oeuvres. For the main reception you may want to include: appetizer, salad, soup, entrée, cake, and other desserts (a champagne toast is always fun too!). Discuss with your caterer what pieces of equipment they provide: plates, linens, utensils, tables, chairs, etc. Check to see if printed menus at served dinner or food descriptions at buffets are provided by the caterer. Clarify beginning and ending times for catering service. Work with your caterer to set a deadline for final head count of wedding guests. Create a “Final Timeline of Events” for your wedding day and send a copy to your caterer. Enjoy your delicious wedding day meal! At Scarborough Fare Catering we serve all of eastern and central North Carolina. Our weddings are completely customizable! We work with brides and grooms to create the perfect wedding menu to suit their big day. Contact us today!